WITH a slight blue glow bathing their faces, the four musicians tapped their feet. It was not to keep time but to send pages of music flying by electronically on their stands. The Borromeo String Quartet was rehearsing Beethoven’s Quartet in C (Op. 59, No. 3) last week. But instead of reading parts perched on music stands, they followed Beethoven’s notes, in his own handwriting, from the screens of MacBooks. A projector attached to a laptop beamed the manuscript onto a screen behind them. “It’s an incredible experience, watching the handwriting of Beethoven as it passes by you,” said Nicholas Kitchen, the group’s first violinist. The digital tide washing over society is lapping at the shores of classical music. The Borromeo players have embraced it in their daily musical lives like no other major chamber music group. They record nearly all of their concerts. They have forsaken paper musical parts in favor of MacBooks nestled on special music stands, paging forward and back with foot pedals. They have replaced old-fashioned tuning devices and metronomes with programs on their laptops. The Borromeo provides an example of how technology is shaping the production and creation of classical music, a bastion of traditional acoustic sound and repository of centuries-old masterpieces. 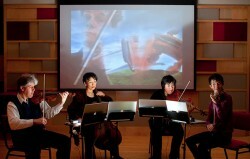 Operas and concerts are being projected live in movie theaters; music has been written for cellphone ringers and laptops; concert audiences are seeing more and more multimedia presentations; orchestras use text messages to stay in touch with audiences; long-distance musical instruction through high speed Internet2 is common; YouTube videos are used for auditions. Many orchestras now present programs with sophisticated, high-definition video images accompanying the music. With the Borromeo the contrast is all the more striking. A string quartet is the ultimate in musical refinement, four exquisitely blending instruments capable of infinite nuance — two violins, viola and cello that have essentially been unchanged for more than 400 years. Absorbing the technology did not come easily for these players. Longstanding professional string quartets are delicate organisms, in which egos must be balanced, personalities meshed and artistic compromises reached. The push for blanket recording and laptop stands caused tensions. Several members were slow to embrace the practices. At least one felt pressured to do so. But now, they said, the methods have become second nature, merely handmaidens in service to basic music making. The Borromeo began selling its live concert recordings in an October 2003 performance at the Tenri Cultural Center in Manhattan, where it was scheduled to return on Friday. Also on Friday the quartet was to open a homemade Web store, livingarchive.org, to sell its performances online, as downloads or in hard copy. The Tenri program is to include the Beethoven quartet; the Canzona movement from Gunther Schuller’s Quartet No. 3; the premiere of a quartet by Mohammed Fairouz, “Chorale Fantasy”; and a version of Bach’s Passacaglia and Fugue (BWV 582) modified for electric string quartet by Mr. Kitchen. The Borromeo had its origins in the late 1980s at the Curtis Institute of Music in Philadelphia, where Mr. Kitchen; Yeesun Kim, the cellist; and the other two original members were students. Mr. Kitchen and Ms. Kim met there at 16, began playing music together and within a year became a couple. (They are now married and have a 7-year-old son who often travels with them.) On leaving Curtis the quartet moved to the New England Conservatory of Music to study as a group for an artist’s diploma. The other two current members are the violist Mai Motobuchi and the second violinist Kristopher Tong. They took their name from the Borromean Islands in Lake Maggiore in Italy, near where they played their first concerts. Accolades followed. They joined the New England Conservatory faculty, won a Young Concert Artists Award in 1991 and a Cleveland Quartet Award in 1998, played as part of the Chamber Music Society Two of the Chamber Music Society of Lincoln Center and received an Avery Fisher Career Grant in 2007. They have grown into a much respected ensemble. By now the quartet has more than 800 concerts in its archive. “I have a mountain of hard drives,” Mr. Kitchen said. They are piled in an extra apartment the couple maintain in their condominium complex here in Jamaica Plain. Mr. Kitchen lugs around a 40-pound backpack of equipment for each performance. It takes about an hour to set up for a concert. In the early years quartet members divided the labor of taking and shipping orders. The work, they said, became overwhelming, and they decided to sell selected performances through the Web site. The quartet also uses recordings to teach and to prepare for concerts. Musicians have listened to themselves since recording became possible, but the Borromeo players take it to an extreme. Before every concert they run through a program and immediately listen to it, “with the rule that nobody should talk while they’re listening,” just like an audience member, Mr. Kitchen said. Members of other prominent quartets expressed admiration for the Borromeo’s method but had no immediate plans to follow in their footsteps. At the Beethoven rehearsal, in Pierce Hall at the New England Conservatory, the discussion was traditional. Mr. Tong questioned the color of sound in a quiet section after a loud passage. Mr. Kitchen suggested a more even-sounding series of bow strokes. Ms. Kim, who often plays with the half-smile of someone enjoying a subtle joke, worried about the others’ covering a low-voiced cello passage. The Borromeo permitted this amateur-clarinet-playing journalist to try a test run on the laptop. A reading of the first movement of Mozart’s Clarinet Quintet was unnerving. One foot tap came too late, causing a page turn delay. An aging eye, already squinting at the tiny notes, sometimes had trouble finding its place. Watching the score and listening to the quartet’s beautiful playing during rests proved distracting enough to lead to a late entrance. Marking the part with the Acrobat tool was cumbersome. All these difficulties, the musicians said, are quickly overcome. For the Borromeo the use of laptops grew out of a nontechnological impulse. Mr. Kitchen decided he wanted to read his music from a full score — all four lines of the quartet together — rather than from his individual part. That requires many more page turns and makes the use of printed scores impractical. So, inspired by the example of a pianist friend, Mr. Kitchen scanned scores into his laptop, which he placed on a portable stand that came with a foot pedal attachable through a USB (Footime, about $80). He started using the system for rehearsing, and one day in December 2007, for the performance of an unfamiliar piece, his colleagues suggested he take it onstage. The quartet, fearful of battery failure, plugs the computers into power sources, covering the wires with a patterned Thai blanket. The players also carry hard copies of their parts as backup but say they have not experienced a computer crash yet. They use 15- or 17-inch MacBook Pros. The setup often draws curious inquiries from audience members new to the Borromeo. And lighting is never a problem. Mr. Kitchen, 44, the first to adopt the laptop system, kept pushing for it. “We had arguments and aggravated conversations about the issue,” said Ms. Kim, 43, who had little hesitation. Ms. Motobuchi, 35, said she took about six months to get used to it. Mr. Tong — at 29, the youngest and newest member of the group — resisted the most. He still sounds not completely happy with the situation. Mr. Tong held out, at least in more traditional repertory, until early last season. “I definitely felt like I was being pushed in a direction,” he said, “which I resented.” But in the tradition of healthy quartets, the members hashed out their differences during a long rehearsal. Mr. Tong came aboard and, he said, now sees the merits.